고려시대 만들어진 청자 대접으로 높이 5.0㎝, 아가리 지름 16.2㎝, 밑지름 4.4㎝의 크기이다. 몸체가 부드럽게 벌어져 올라가다 위에서 바깥쪽으로 약간 휘어진 것이 전체적으로 날렵하게 되었으며, 그릇의 두께도 얇아 뛰어난 세련미를 보인다. 대접의 안쪽에는 얕고 정교하게 양각된 연꽃과 덩굴무늬가 옆면을 따라가면서 잔잔하게 베풀어지고, 아가리 아래에도 양각된 덩굴무늬 띠를 새겼다. 바깥 면에는 몸체의 아래 위에 두 줄씩 흰색 상감선을 둘러 띠를 만들고, 그 사이에 운학문을 상감하였다. 이 무늬는 구름과 학이 각기 독립되어 시원스럽게 표현되었는데, 삼감청자 전성기에 운학(雲鶴)이 뒤섞여 조밀한 구성을 보이던 것과는 차이가 있다. 상감기법도 얕으면서 붓으로 그린 듯 자연스럽게 처리되고 있다. 바탕 흙은 약간 짙은 회청색에 표면은 맑고 투명한 푸른 빛깔을 머금고 있으며, 전면에 가는 빙렬이 보인다. 하나의 기물의 안팎에 양각과 상감이라는 다른 기법이 동시에 베풀어진 보기 드문 예로 모양과 무늬가 우수할 뿐아니라, 상감청자의 초기 상황을 이해하는데 좋은 자료이다. 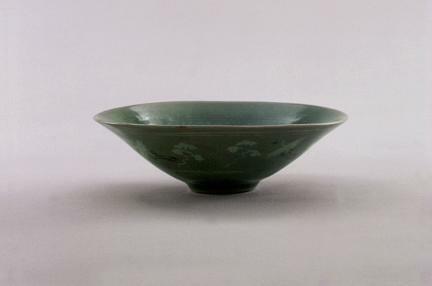 Made during the Goryeo Dynasty, this celadon bowl has height of 5.0 cm, mouth diameter of 16.2 cm, and base diameter of 4.4 cm. Overall, it looks slim because its body widens gradually as it moves upward and appears slightly rolled outward at the top. The fine thickness of the bowl adds sophistication to its look. Shallow and exquisitely embossed lotus flowers and scroll designs unfold slowly and subtly along the inner side of the bowl. In addition, a band of embossed scroll design is found beneath the lip of the bowl. The two white inlaid lines form a band around the lower exterior of the body, with a set of cloud and crane designs inlaid between the lines. The clouds and cranes in the design are made independent of each other to create a refreshing image, unlike the typical designs made during the heyday of the inlaying technique when clouds and cranes are placed densely together. The inlaying technique is applied lightly as if treated with a brush to give a natural appearance. The clay base, which has a clear and blue surface, has grayish blue tone, with small cracks all over the surface. This is a very rare piece displaying both embossment and inlaid designs on the inside and outside of the bowl. 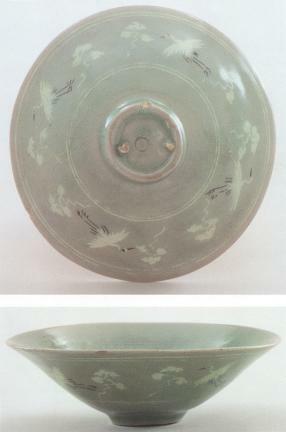 It has excellent patterns and designs and provides good information for studies on celadon pieces with inlaid designs, which were made in celadon’s early days.